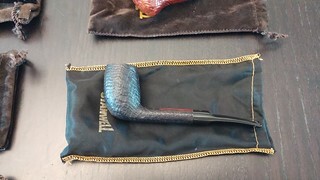 Many pipe producers release an annual Pipe of the Year – a limited-run pipe in a distinct shape and finish representing the very best a pipemaker can produce each year. 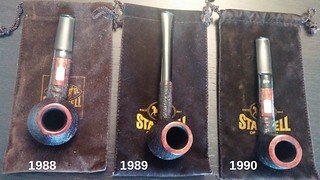 Coming from a highly regarded and skilled producer like Stanwell, these Pipes of the Year are top-notch pipes and highly collectible, so I was very excited to find no less than six Stanwell Pipes of the Year in the estate lot I’ve dubbed The Danish Collection. 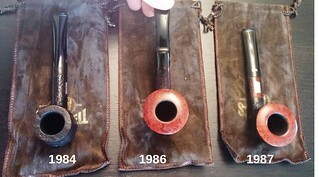 Laying them all out, I found pipes from 1984, 1986, 1987, 1988, 1989 and 1990. 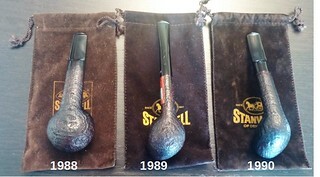 These years are significant, as Stanwell only started producing Pipes of the Year in 1979, and 1984 was the first year these pipes were available in North America in any significant quantity. 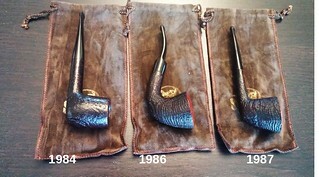 Of the six, four were in unsmoked, New Old Stock (NOS) condition; the remaining two pipes (from 1984 and 1989) were in excellent used condition. They had not seen a lot of action, and would clean up easily. 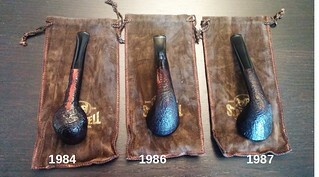 The biggest issue with this handful of special edition pipes was stem oxidation – they had obviously spent most of their lives in a pipe rack, facing a window, as the stems had bands of oxidation across the front of the stems, broken by a darker area where the pipe rack had blocked the sun. Here are all six pipes as they looked on arrival. 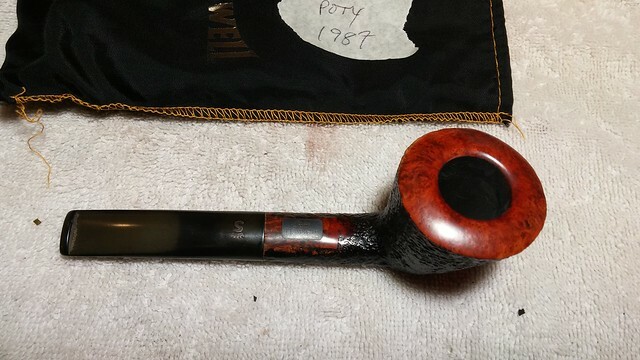 Rather than bore you all with details from each restoration, which are more or less the same, I’ll take you through the work on one pipe, the 1987 Stanwell Pipe of the Year. 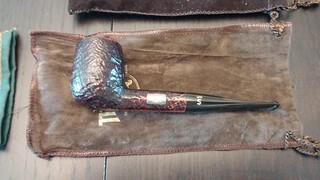 This pipe, like all the POTY’s in the collection, was in excellent condition when it came to me. 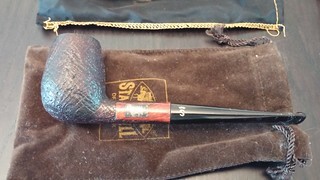 In fact, it is unsmoked, though someone had “test fit” the stem in the mouth at least once. 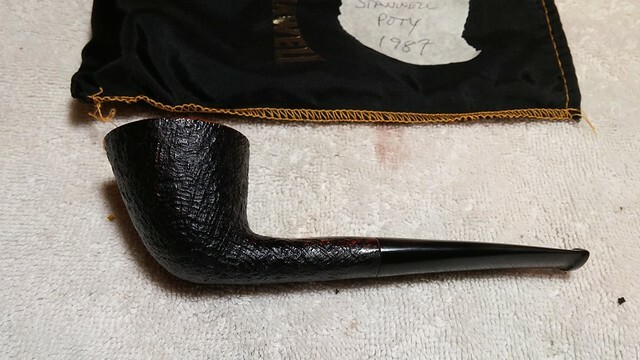 There was zero soot or cake in the bowl, which was in perfect condition, except that the factory bowl coating was flaking away from the chamber walls. The draft hole is drilled very nicely, meeting the bowl just behind the “point” of the conical chamber. 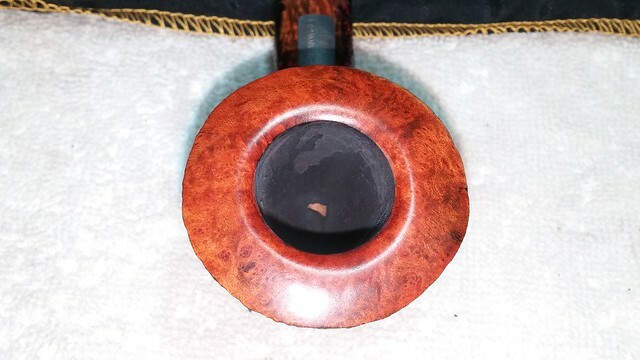 The finish too was almost perfect, with only a small amount of handling wear – a bit of around the shank/stem junction, and a small sliver of finish rubbed away from the outside rim. 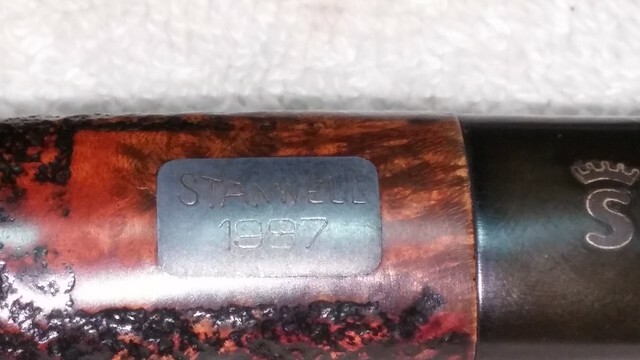 The stem showed a trace of light brown buildup just behind the button – the only proof this pipe had ever been in someone’s mouth – and both the silver POTY plaque (which reads “Stanwell” over “1987”) on the shank and Crowned S logo on the stem were tarnished. 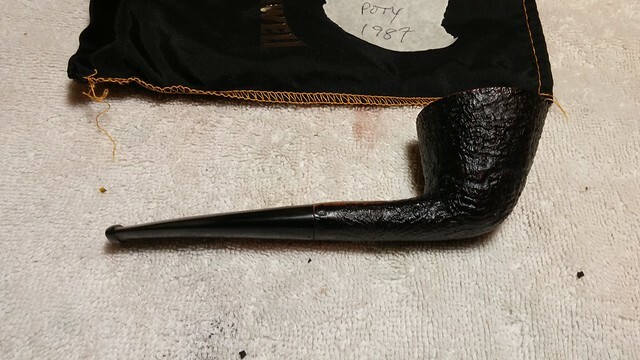 A quick cleanup would have this good-looking Dublin ready for action again. 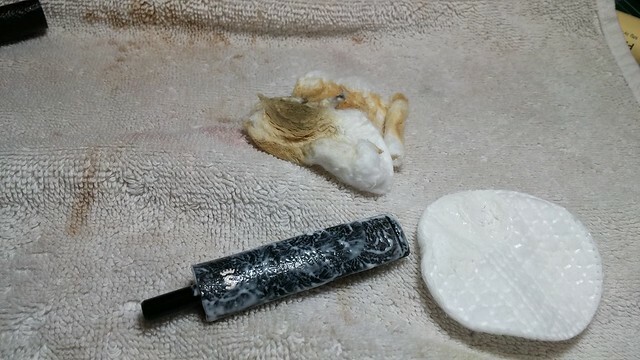 I used a dental pick to gently remove the flaking bowl coating, and followed up with a quick twist of sandpaper to smooth things out. 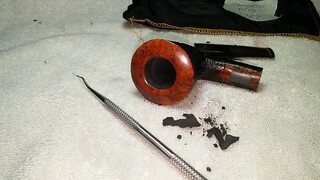 In the pic below it is immediately clear that this pipe has spent its life sitting in a pipe rack facing a window – the top surface of the oval taper stem was lightly oxidized, with a band of black across the middle where the wood of the pipe rack shielded the vulcanite from the sun. 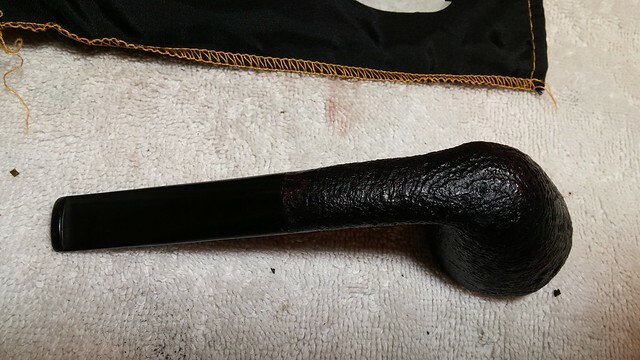 The other side of the stem was still a deep, solid black colour. I ran a few pipe cleaners through the stem and shank. As anticipated, they came out clean but for a little dust and bowl coating debris. 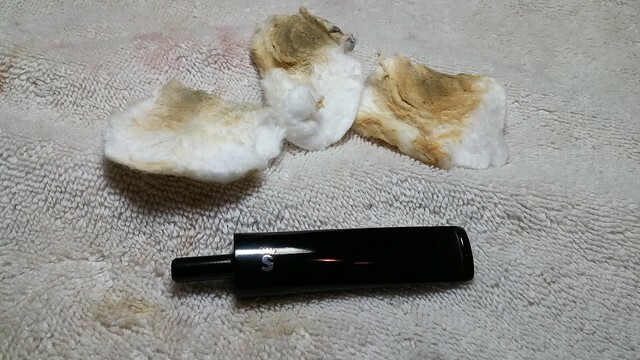 The stem oxidation was removed with Meguiar’s Scratch-X plastic polish, applied with cotton pads. 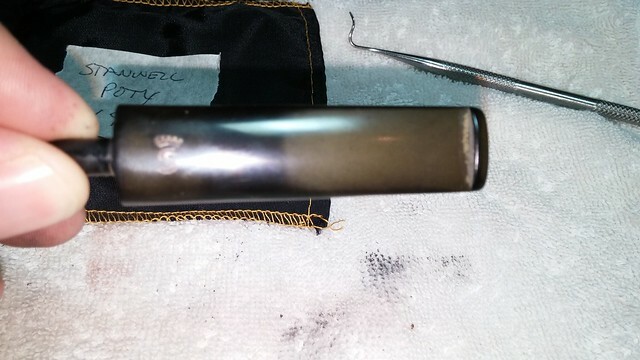 In all, it took three pads and a little elbow grease to get the top of the stem as black and lustrous as the bottom. The Meguiar’s also removed the tarnish from the Crowned S logo. It’s looking snappy now! 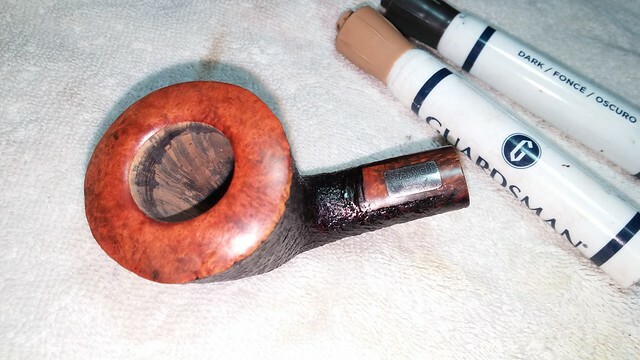 I washed the exterior of the stummel with Murphy’s Oil Soap to remove the dust from the sandblast finish, and rubbed it dry in a soft cloth before using my stain markers to touch up the finish on rim and shank. 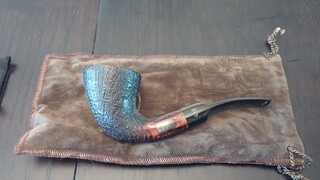 I finished off the refurbishment with a fresh bowl coating. 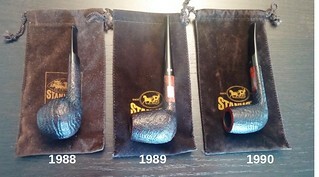 I figured if Stanwell sent it out of the factory with a coating, it might as well have a coating. 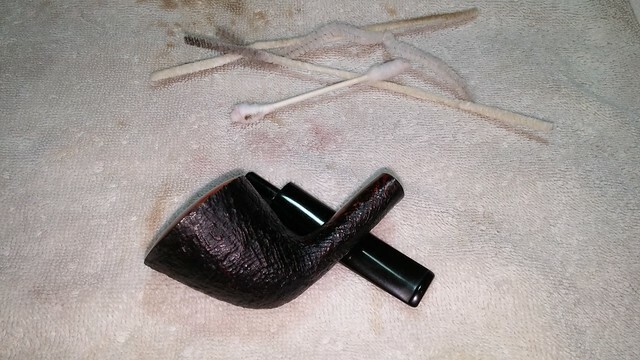 Over the last few years I’ve applied a fair few bowl coatings using maple syrup and activated charcoal powder, and I think I’ve landed on the easiest method. I slide a pipe cleaner into the shank until it just meets the draft hole, and wipe a small amount of syrup around the inside of the bowl using a convenient finger. 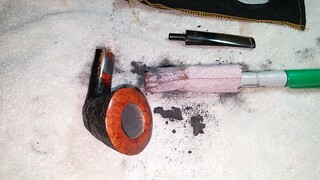 Then I pour in about a half teaspoon of charcoal powder, cover the bowl with my thumb and give the pipe a good shake. Works like a charm! Then it was off to the buffer for a quick polish with White Diamond compound and a few coats of Carnauba wax. 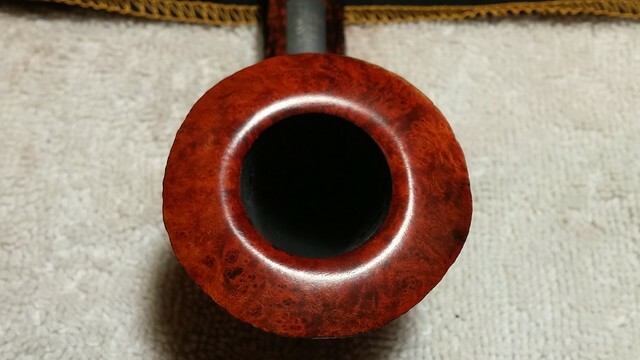 The smooth, red-stained rim really pops against the black sandblast. 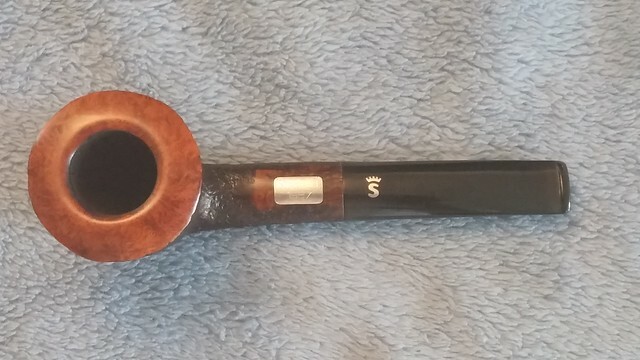 It’s a classic colour combination on a classic pipe shape – always a winner in my book. The silver accents of the POTY plaque and stem logo notch up the wow factor as well, and you could practically shave in the reflection from the glassy vulcanite stem. 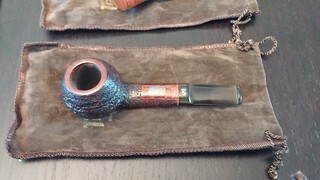 Here’s the finished 1987 Stanwell Pipe of the Year. 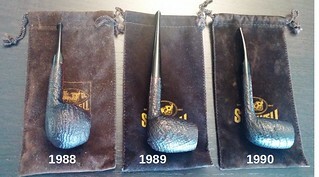 And here is the entire collection of Stanwell Pipes of the Year. 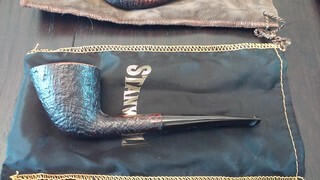 This is a ready-made six-day set for the Stanwell lover old or young, or, just as easily, the centerpiece of a new or established collection. I’ll be listing the complete collection on the DadsPipes Store soon. 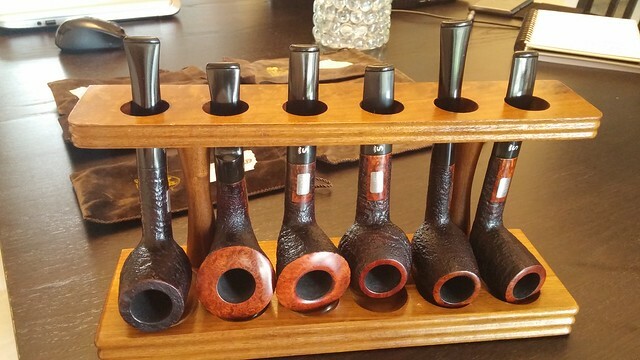 That’s all six Pipes of the Year, with socks, and the vintage walnut Decatur pipe rack shown in the pic above. It’s a great opportunity to start or add to your collection or buy that very lucky piper in your life the gift of a lifetime! That is a great set, I bet they don’t last long on your site. Thanks Al. They’re a good-looking bunch! Thanks again, Charles. The pipes look fantastic! Dale would be very happy and excited to see them as restored. He loved his pipes! So am I – it’s a great collection. Dale had great taste in pipes. That is a gorgeous collection, Charles. Someone is going to be very happy. I certainly hope so! I’m very tempted to keep it! 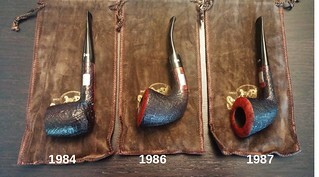 It is hard to put some pipes we restore up for sale. I’m sitting with about six that I am debating on. It’s been about a year and I still can’t decide whether or not to offer them for sale. Too true. Working on the pipes so closely tends to forge a bit of a bond. It’s easier sometimes working on someone else’s pipe – at least then you know you have to send it back! Charles, nice set and nice clean up. They should make the next owner very happy indeed!